Ours is an age of mockery. An impotently diffuse irony has descended, a haze of tiny hooks, imperceptible quotation marks settling over everything. Consider this sentence: I love this 1976 Rich Folkers card. Air quotes want to pincer the verb and drag it toward some shading of mockery. I should know. I’ve spent over five years writing about these cards nearly every day, and in the process have written thousands and thousands of mocking words. I need look no further than Rich Folkers himself for an example of this mocking tendency in my writing. Consider my post on his spectacularly hideous 1975 card. I wrote that post very early on in this endless tour of mockery and life. In that post I can recall consciously attempting to emulate the concise witticisms that animate The Great American Baseball Card Flipping, Trading and Bubble Gum Book. If I were funnier, wittier, I would have been able to continue approaching every card that way, each card the occasion for a short zinger. Soon enough, however, my long-winded ponderous digressive nature took over, and I started roaming farther and farther from that first delectable sting of irony, that rush of feeling you get when a card reappears in your hands after an absence of decades and all you can do is laugh. In the expanding posts a certain tendency of mine toward attempts at achingly sincere quasi-poetical conceits became part of the proceedings. I remember once early on when a post of mine was linked by The Baseball Think Factory; a commenter in the thread below the link pulled one of my more ambitious beatnik flower-child sentences, put quotes around it, and supplied a devastating monosyllabic response: “Ugh.” I felt it like the syllable had been propelled into my flesh with an air rifle. I’d been quoted, I’d been mocked. What can you do? This is the world. Keep going. Try every day to see these cards with new eyes. Try to see everything with new eyes. It is a ridiculous thing for me to say. My life is monotonous, my courage meager and probably like everything else eroding. Most days I feel ridiculous, and those are the good days. Bad days I’m entirely enclosed in air quotes, product of a cosmic mocking. “Josh Wilker” rides the bus. “Josh Wilker” eats his lunch. “Josh Wilker” gazes at a 1976 Rich Folkers card and tries to shake the quotation marks, those sardonic hooked spores, off of his conviction that it is a thing of beauty. So on to the card. There are some differences between this image and the first image in this series, that of Alan Foster. The sky here is entirely cloudless and has deepened in color. A shadow from the figure’s upraised arms is falling on his chest. The icon in the lower left corner is a reverse of the icon in the previous card. We are looking at a left-handed pitcher. He does not have a mustache or sideburns. He has aviator-style glasses. There is some damage to the card, along the top border, possibly the 36-year-old residue of gum. The damage makes this card worthless, I suppose, but also unique, one-of-a-kind. And personal. The gum that fucked it up—I chewed that gum as an 8-year-old boy. There are also qualitative differences between the two Padres cards from 1976 and the 1957 Dave Sisler card featured most recently on this tour. The Dave Sisler card is washed out, drab; the color of the sky not as deep, producing a weak ineffectual contrast with the figure in the foreground, a compositional problem compounded by the unintentional cluttering of other shapes intruding haphazardly in the background. The photos on the 1976 cards evidence a much more focused and sensitive artistic sensibility than the photo on the Dave Sisler card. On the next stop on this tour, I will talk some more about the artist behind many of the photos on the cards that have come to center my ridiculous life. But for now, let’s linger for one last moment on Rich Folkers. 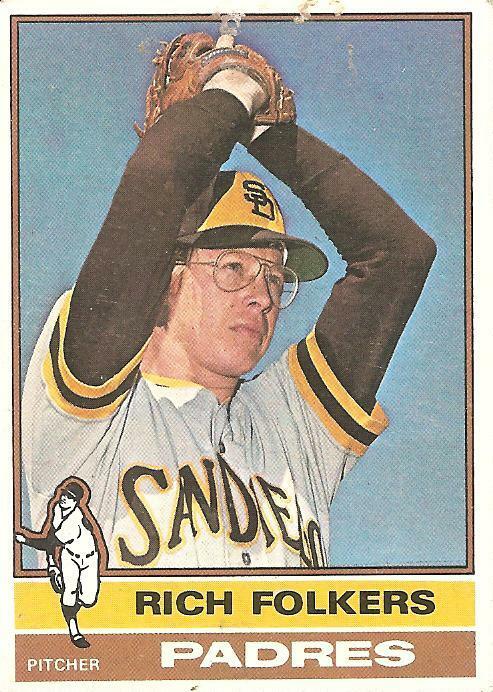 Rich Folkers, journeyman reliever, bespectacled ectomorph, remembered if at all not for any heroic feats but for a Jerry Coleman malapropism (“Rich Folkers is throwing up in the bullpen”), is in his 1976 card transported beyond the deflating ironies of this world, his form natural but somehow purified, a sculpted undeniable presence lit by the sun, encased in cheap gum-flecked cardboard but haloed in a beatified cerulean emptiness. Imagine yourself in such a card. Can you see it? Maybe that’s you for once, for real. Intentionally or not, Josh is referencing Rlike here. “The damage to the card make it worthless” None of my cards are worthless to me. No matter the condition. They were a BIG part of my childhood. Many happy memories come flooding back whenever I pull them out to look at. I could care less that Johnny Bench’s card has a crease in it, or the corners on Don Sutton are torn off. Long after I stopped buying baseball cards, it turned into a money-making racket. Young kids and adults bought cards for one reason….. to make money. I guess the memories nowadays are how much money they sold so and so’s card for. I just keep picturing the above-linked guy with that “”””mocking”””” look on his face, saying, “somebody say Ceruttian emptiness”? Ha. Good ol’ John Cerutti. the sotheby auction house collectors indirectly give them even more meaning in a light on dark contrasting sort of way. as far as today, a dozen or so commons can still be had for a couple of bucks and if you throw in a walk to the store and a stop at a bar, new stories are bound to happen and get lumped into those cards. josh, i can hear the gospel singers judging your blues and you nodding in agreement and then the whole lot of you sharing a beer. The calendar turns to March. The earth is a little warmer today. Josh, this series has been lovely, an ideal conjuring of the clean slate every spring provides. Optimism in the unknowable future is especially in demand for you on the baseball side of existence, given the recent life changes to Tim Wakefield, Gary Carter, and Jason Varitek. Can it be that you have never reviewed a Carter card? His early days of wine and poutine in Quebec fall right within your Topps sweet spot. Anyhow, I do not wish to detract from Pitcher & Sky. Please continue and share with us your thoughts on Carter and Varitek as you will. i actually like the brown and yellow borders and uniform in this card. When i went to glance at his card i was struck by the ‘animation’ trick my eyes played on me….from folkers wind up to the little pitcher icon in the lower left corner…….try it…..maybe im just bleary eyed…. this card definitely made up for the atrocious 75 card.